Broadway In Chicago is pleased to announce that individual tickets for ONCE, winner of eight Tony Awards including Best Musical and winner of the 2013 Grammy Award for Best Musical Theater Album, will go on sale to the public on Sunday, April 12 at 10 AM. ONCE will play the Cadillac Palace Theatre for one week only from June 2 through 7, 2015. ONCE, which was also named Best Musical by the New York Drama Critics’ Circle, Drama Desk, Drama League, Outer Critics Circle and Lucille Lortel Awards, ran for more than 1,100 performances on Broadway with acclaimed international productions from London and Melbourne to Japan and South Korea. ONCE features the Academy Award-winning music and lyrics of Glen Hansard and Markéta Irglová, a book by award-winning Irish playwright & screenwriter, Enda Walsh (Penelope, Hunger, The New Electric Ballroom), direction by the acclaimed Scottish director of Black Watch, John Tiffany, movement by Steven Hoggett (Black Watch, American Idiot) and music supervision and orchestrations by Martin Lowe (Mamma Mia!). The set and costume design are by five time Tony Award winner Bob Crowley (The Coast of Utopia, Mary Poppins), lighting design is by Tony winner Natasha Katz (Aida, The Coast of Utopia), and sound design is by Clive Goodwin. 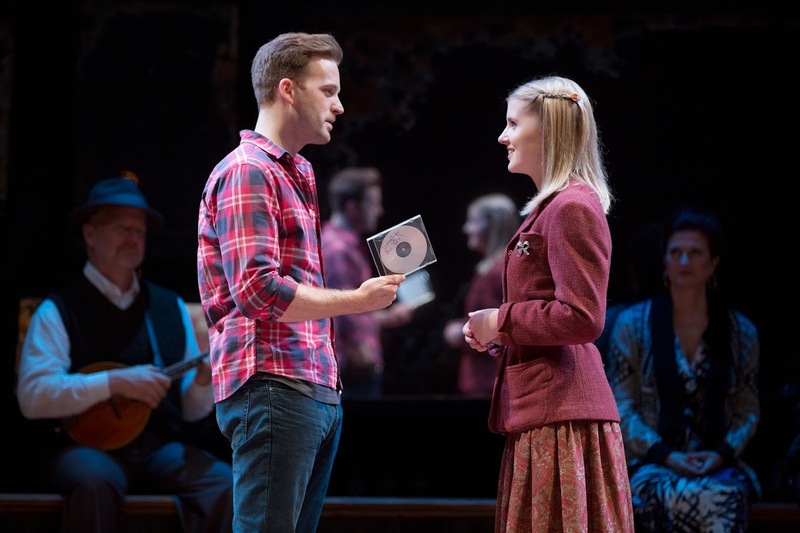 ONCE is the celebrated new musical based on the Academy Award-winning film. It tells the story of an Irish musician and a Czech immigrant drawn together by their shared love of music. Over the course of one fateful week, their unexpected friendship and collaboration evolves into a powerful but complicated romance, heightened by the raw emotion of the songs they create together. Brought to the stage by an award-winning team of visionary artists and featuring an ensemble cast of gifted actor/musicians, ONCE is a musical celebration of life and love: thrilling in its originality, daring in its honesty… and unforgettable in every way. The 2007 Academy Award-winning film, ONCE, was written and directed by John Carney, and starred Glen Hansard and Markéta Irglová, with original music and lyrics by Mr. Hansard and Ms. Irglová. The Oscar winning independent Irish film, ONCE was made for $150,000. Shot in 17 days, it went on to gross $20M worldwide becoming a critically acclaimed international smash. It stars Glen Hansard, from the popular Irish Rock band The Frames, and Markéta Irglová. Glen and Markéta won the 2007 Academy Award for Best Original song for “Falling Slowly,” the Los Angeles Film Critics Award for Best Music, and the soundtrack was nominated for two Grammy Awards. ONCE was originally developed at the American Repertory Theater (Cambridge, Massachusetts) in April 2011; Diane Paulus, Artistic Director; Diane Borger, Producer. A developmental run of ONCE at New York Theatre Workshop (James C. Nicola and William Russo) began performances on November 15, 2011 and opened December 6. The production broke box office records and concluded a sold out engagement including a two week extension through January 15, 2012. ONCE is produced by Barbara Broccoli, John N. Hart Jr., Patrick Milling Smith, Frederick Zollo, Brian Carmody, Michael G. Wilson, Orin Wolf and Executive Producer Robert Cole, in association with New York Theatre Workshop. For more information, please visit www.BroadwayInChicago.com or www.oncemusical.com. Individual tickets for ONCE at the Cadillac Palace Theatre range from $30-$95. A select number of premium seats are also available for many performances. Tickets are available now for groups of 10 or more by calling Broadway In Chicago Group Sales at (312) 977-1710. Tickets are available at all Broadway In Chicago Box Offices (24 W. Randolph St., 151 W. Randolph St., 18 W. Monroe St. and 175 E. Chestnut), the Broadway In Chicago Ticket Line at (800) 775-2000, all Ticketmaster retail locations and online at www.BroadwayInChicago.com. For more information, visitwww.BroadwayInChicago.com.